Volkswagen Passat Performance, Engine, Ride, Handling | What Car? Many drivers will regard the entry 1.6-litre diesel as adequate, with enough guts when pulling away from the lights and to keep a steady motorway cruise. However, the stronger 148bhp 2.0-litre diesel provides more oomph and is punchy enough to offer satisfying pace and easy overtaking. Its willingness to pull from low revs makes it more relaxing to drive, so much so that, unless you're a real speed demon, it’s not worth paying the extra for the 188bhp version. If you really want to get a move on, though, you can take things even further with the range-topping 236bhp twin-turbo 2.0 BiTDI diesel. This feels genuinely fast and, thanks to its standard four-wheel-drive’s added traction, not even slippery surfaces prevent it deploying all that power. For those who don’t want a diesel, the 1.5-litre petrol produces 148bhp and in most circumstances, provides decent performance, revving keenly and feeling sprightly. However, if you find yourself trying to overtake on a steep hill, you'll miss the lusty mid-range slug of a diesel. The 1.6-litre diesel and 1.5-litre petrol come with a six-speed manual gearbox as standard, while every other engine uses VW’s seven-speed dual-clutch automatic ‘box (optional with those two engines). The auto can hesitate a little from a standing start but, once you're rolling, snaps eagerly up and down its gears and kicks down promptly when you demand a lower gear. 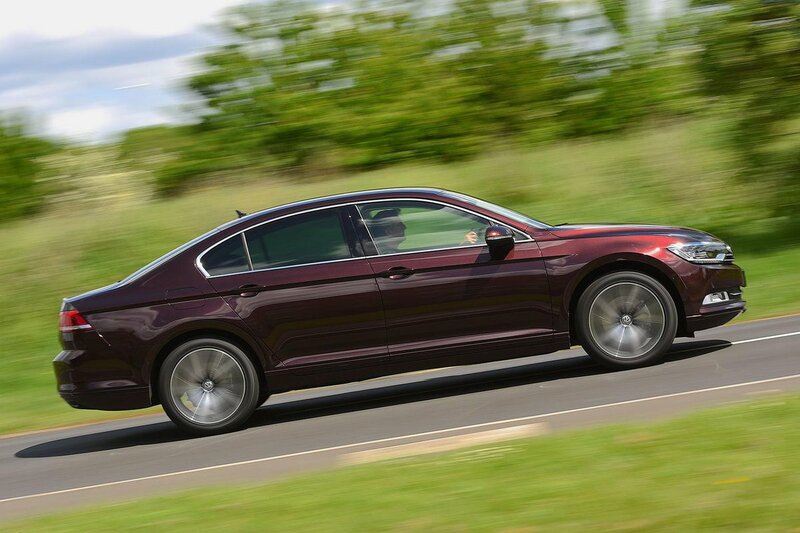 The Passat is softly sprung as standard, making it a comfortable motorway cruiser. It's a bit lumpier on uneven urban roads, but never jarring or irritating. We recommend sticking to smaller 17in wheels where possible, though; the larger wheels might look great, but they don’t do the ride any favours, making potholes and larger bumps more pronounced. Optional adaptive dampers are available that have three modes: Comfort, Normal and Sport. Comfort mode does a decent job of ironing out all but the sharpest and nastiest ridges and keeping things smooth and wafty over bigger bumps, being particularly impressive on patchy motorways surfaces. Even in Normal mode the ride is still mostly agreeable, but the Sport mode is rather firm and best reserved for the smoothest roads. The standard fixed suspension strikes a good balance between firmness and comfort, and will offer a more than comfortable ride for most journeys. 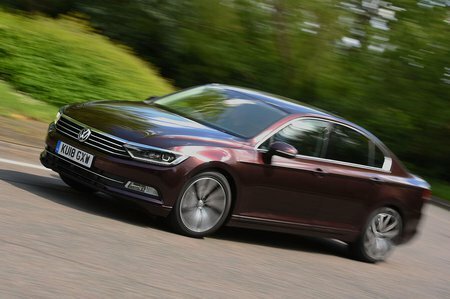 On the regular non-adjustable suspension, grip levels are high but the Passat never feels agile or involving. The optional adaptive dampers allow a fair bit of pitch and dive from the body in Comfort mode, but Normal keeps things taut enough. The Sport setting makes the car more uncomfortable rather than entertaining, though. Even the 236bhp four-wheel-drive model leans more towards feeling secure and planted than genuinely sporty, so those looking for fun behind the wheel should consider a BMW 3 Series or Alfa Romeo Giulia instead. All models from SE Business trim upwards have a driving mode button, using which you can alter the weight of the steering, the responsiveness of the accelerator and, if fitted, the action of the adaptive dampers or automatic gearbox. 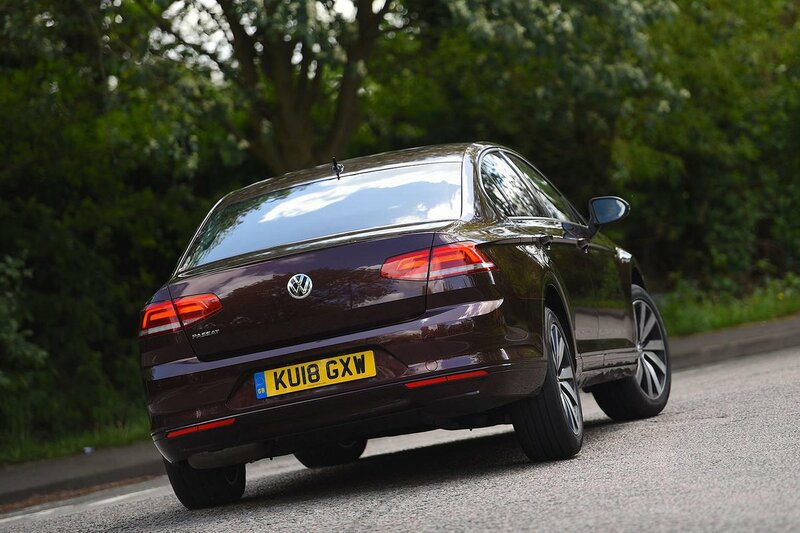 Compared to the Mazda 6 or Audi A4 diesel, the Passat’s 1.6 TDI is gruff. And, and even though the 2.0 TDI is better, it still sounds comparatively boomy and clattery at low revs – the twin-turbo BiTDI unit more so. By comparison, the petrol makes much less of a fuss and only starts to sound strained when worked hard. Thankfully, most of the engine noise fades into the background at motorway speeds, where you'll also encounter very little wind or road noise. Bear in mind, though, that the bigger, optional wheels produce more noticeable roar from the road. Whatever engine you opt for, if it's hooked up to the dual-clutch automatic gearbox it'll be frustratingly jerky in stop-start traffic or when you're nudging back and forth into a parking space. In these circumstances, the manual gearbox is much better, with a light change action and defined clutch bite point.